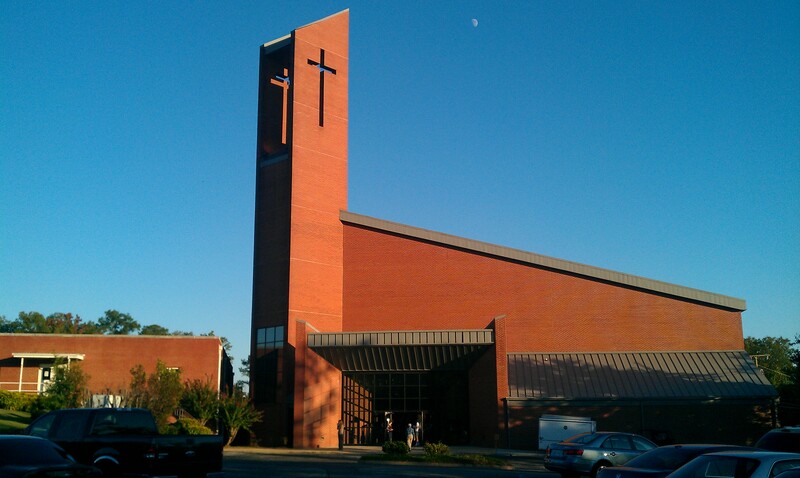 Laura and I pulled up to Hixson First Baptist Church into what looked to be a pretty good-sized crowd for a Wednesday night service (of course I really don’t have any frame of reference because I only go to church on Sundays, remember?). We approached the entrance, which was flanked on both sides by some giggling teenage girls (every church has them), so I stopped to have my picture taken with two of them and then we proceeded on inside. 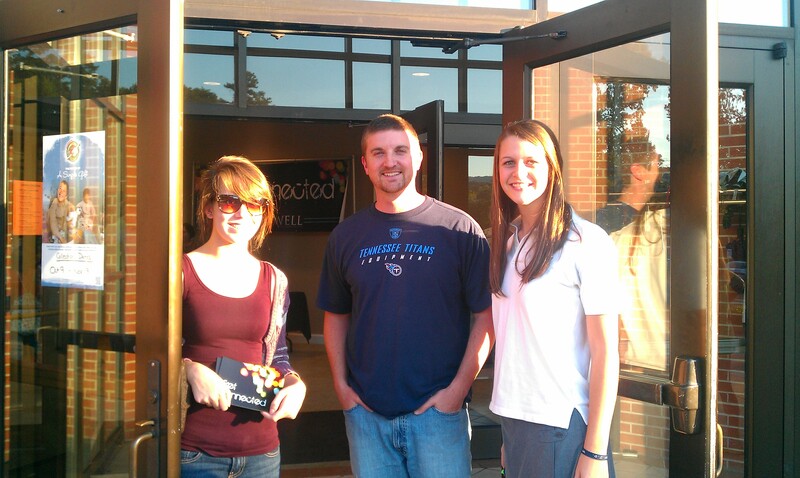 We mingled around in the lobby for a few minutes and met Justin, the Youth Pastor, as well as a few other people and then decided to go on into the sanctuary. The room was pretty typical of clean and simple modern church architecture with rows of traditional wood pews both face-on toward the center of the stage and flanked at angles on either side. There was a vacant orchestra area to the right of the stage with music stands and instruments that gave me a clue of what the Sunday service music consisted of, but for this service there was a four-piece praise band set up on stage surrounded by speaker stacks and decorative blocks lit up by multi-colored lights. Justin, the Youth Pastor, came up to the front and offered a short explanation of what the vision for The Well was, stating that this was not just a Wednesday night service, but would also take shape into small groups, local outreach, and global missions. Justin led the congregation in a prayer and also offered encouragement by explaining that there were church members in another room praying for this new ministry as it was happening. The praise band, whose lead singer spoke with an Australian accent, took the lead and launched into some rockin’ Christian-radio-style praise music and souped-up versions of well known hymns. After singing a few songs with times for prayer and meditational worship mixed in, the pastor came up to begin the sermon. Senior Pastor Myron Wilkins began preaching from a stool on stage, telling a story about growing up in an inner city African-American Methodist church and remembering a time when a mostly white church invited in various groups for a multi-cultural worship service. He recounted how beginning with the white church choir and then progressing into music from the black gospel choir, the energy began to get amped up and up, finally culminating with a Latin salsa band that had people dancing. He noted how each of the styles of these worship groups may have been different but they all lifted up the King of kings. Pastor Myron related this story to his Scripture teaching for the evening, John 4:19-24, and how the Samaritan woman had been told by Jews that worship should take place in Jerusalem not on the mountain which the Samaritans typically worshiped. We do that a lot in today’s Christian world don’t we? It really seems to be my experience that worship style is probably one of the top two divisive factors in the Christian church along with doctrinal beliefs. It is truly dumbfounding to me that worship can divide us. We actually have the nerve to tell people that they are not worshiping God to our liking. Think about that. I have heard numerous stories about churches who have lost members because they changed the style of their worship music…or even worse, I have heard stories about churches who chose not to change their worship music for fear of a member exodus. Seems pretty fickle, eh? Now don’t get me wrong, there are extreme circumstances where people actually may be incorporating sinful or unbiblical acts into their worship, and those instances should judged and dealt with as we are instructed in the New Testament, but in those rare cases we are not talking about adding electric instruments or switching to praise songs from hymns. When you get down to the root of it, are not all of those types of disagreements more about us than anything? Do they not just show our inability to compromise or get along with one another? Shouldn’t our decisions about worship be about the object of our worship rather than the worship itself? Jesus thought so and so does Pastor Myron. Jesus spoke to the Samaritan woman about a time when true worshipers would worship the Father in spirit and in truth. Pastor Myron spoke about the necessity for our music to be focused on Christ, and that if it is not, it doesn’t matter how good it sounds. He continued by explaining that in order for our music to be focused on Christ, He must be present and receiving the worship that is due Him. Therefore, worship is not a talent issue, it is a heart issue. We must have Christ in our hearts to succeed in worshiping the Father in spirit and in truth. If arguing about using a song book versus a hymnal, playing electric instruments, piano and organ only, or no musical instruments at all, singing fast songs or slow songs, raising hands, clapping, jumping, dancing, standing completely still, singing while wearing robes, or any other worship style “argument” is taking center stage in our churches, then I can tell you right now that we are not worshiping in spirit and truth. In John 4:23 Jesus says Himself that “…the Father is seeking such to worship Him.” God help us. After Pastor Myron wrapped up the service with a traditional Baptist salvation message and altar call (which he called “come do your business with God”), the congregation was dismissed and invited to hang around for some fellowship time with refreshments in the gym/dining hall. Laura and I went on over and had a great time eating some cookies and other treats and meeting some friendly folks, including the mystery Facebook user who invited me. It turned out to be Matt Stelzman, who works in the same building as me and had heard about the ChurchSurfer blog and decided to invite me at the last minute. I am glad he did because I received multiple blessings on that Wednesday evening, including a thought provoking sermon and a few new friends. For anyone looking for a little bit of a different slant on the traditional Baptist church service, The Well seems like it is intended to be (or maybe not) a church within a church, bringing together people who are looking for corporate worship that extends into small group meetings, focused outreach, missions, and prayer. 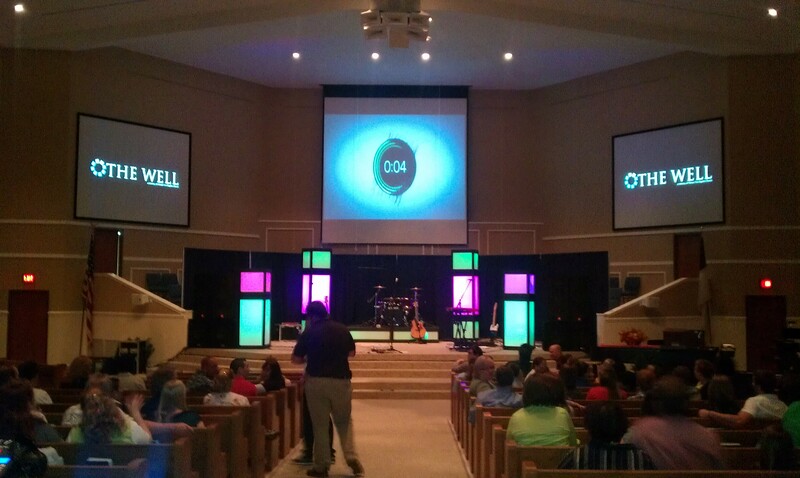 Taking a piece from Pastor Myron’s sermon message, I would imagine that the organizers of The Well are seeking to do this within the context of Hixson First Baptist as a way for existing members to find some variety in worship and service without creating a division within the church. I’m sure those who attend The Well will not give up gathering together on Sundays and taking part in other church activities, which leads me to my encouragement for anyone reading this article. Why not seek something more within your church rather than something different outside of your church. This may require you being the initiator, the leader, or the organizer of something, but the hope would be that it would be a way for you to serve and add to your church rather than divide and take away from it. Josh, it was nice seeing you. We hope to have you back soon and also have you bring a little action to the basketball court. Enjoyed The Well and all the great people I met…thanks again for the invite! Oh, and I’ll definitely take you up on some b-ball! I’m so glad you enjoyed your visit to HFBC and The Well! I am disappointed I missed the kickoff night due to illness, and meeting you! It’s going strong and I have definitely enjoyed the mid-week worship experience more than I ever have. Hope you or your readers will consider coming back. Thanks Jessie! 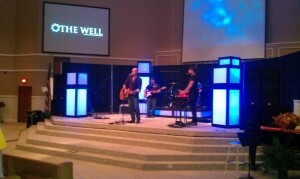 I’ll be praying for the ministries at HFBC and The Well. Don’t be disappointed you missed meeting me, I’m not much to shake a stick at…probably a lot more entertaining on my blog than I could ever hope to be in person, and that’s not saying much. Love the encouragment for folks to get involved in their churches instead of seeking things outside. 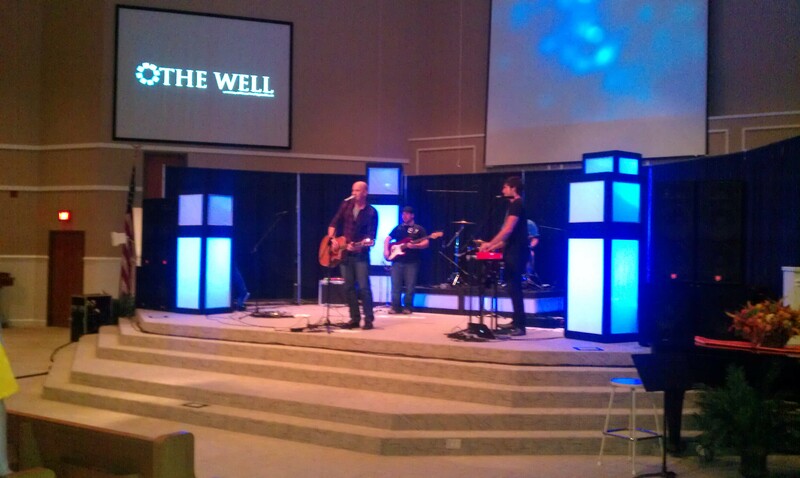 Thanks for sharing and thanks for coming to the Well! Hope you’ll join us again sometime. Josh, I was incredibly blessed by this blog post– both the description of the new vibrant ministry at ‘The Well’, and also your insights about being a catalyst of service and worship at your own church, as opposed to division through the ‘shopper’s mentality’. That is a needed and pertinent statement for today’s society. I’ll be praying for the Well, your blog, and your travels through the Chattanooga churches. Thank you for the kind words Alan! I agree that the “shopper’s mentality” leads to division and also a loss of focus, or rather a change of focus to ourselves rather than on God and serving others. I pray that we, as Christians, will not be influenced by society except to know that if our churches are a reflection of it that we are probably doing something wrong and need to change. Thank you for your prayers!